Draupadi, the wife of the 5 Pandavas, the erstwhile rulers of Indraprastha, has been put up as a stake (!) in a game of dice against the Kauravas. The dice rolls, and the Pandavas lose. 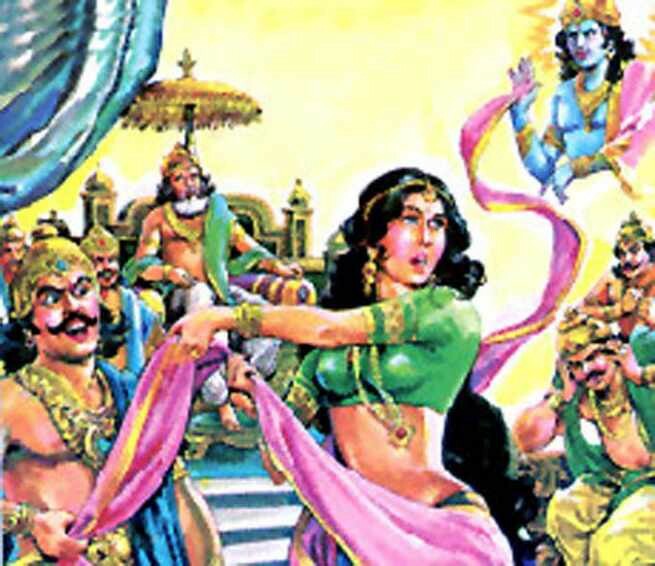 Draupadi has been won by the Kauravas. Not a part of the game, Draupadi is dragged to the court by Dushasan — the second eldest in the royal line of the Kauravas. The elders & the king of Hastinapura turn a blind eye to Draupadi’s protests of the legality of her being used as a stake in the game. On the other hand, the evil Kauravas have their own agenda. The eldest of the Kauravas orders Dushasan to disrobe Draupadi to quench his thirst for revenge, as they technically owned her now. And here’s where a miracle takes place — no matter how hard Dushasan tries, an unending stream of cloth continues to cover & protect the dignity of Draupadi — queen of the Pandavas. The above is a scene from the Mahabharata, the grand epic of ancient India. That cloth that covered Draupadi is what was (and is) known as the saree. Over the past 6 centuries, a lot has changed in the world. Fashion trends keep on changing — infact, what was considered fashionable in the 70's of the west is no longer considered fashionable today. In India, there have been thousands of invasions, conquests by foreign rulers, changes in cultures & rulers — and then some. 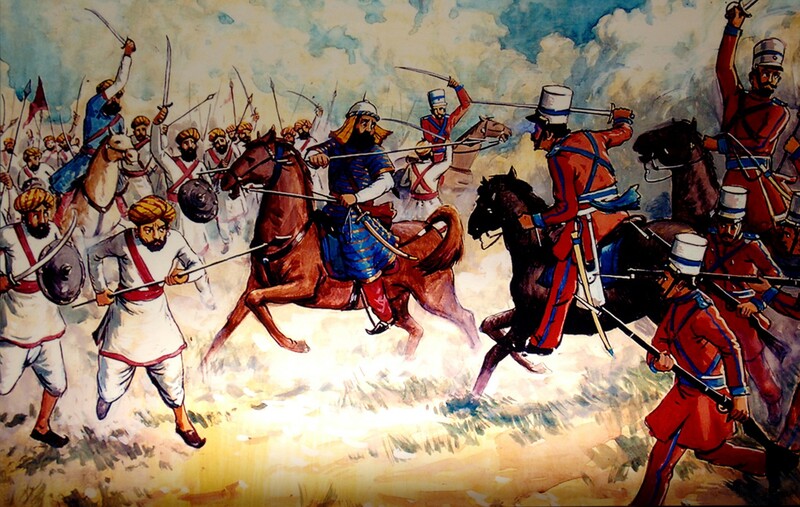 A scene from the 1857 Indian rebellion against the British. India has a long history of invasions, conquets by foreign rulers & conflicts. But there is one thing has been held as a constant despite all — and that is the Indian saree. Notwithstanding the shifts that have taken place in India (and the world) over the last 6000+ years, the inimitable saree is still going strong. Majority of the women in India still wear saris, and it is considered as the primary piece of clothing even in modern wardrobes. 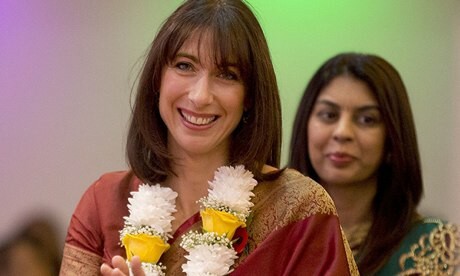 And still, very few people in the west know about the saree. Which is really a tragedy. Infact, on the day of writing this, Wikipedia’s article on ancient forms of clothing doesn’t even have a mention of the saree. So What is The Saree? A saree is a piece of cloth between 5 and 9 meters. It is worn traditionally by all Indian women — and has a great cultural significance. Said to be one of the most graceful dress of women, it elegantly covers the woman’s entire body by showing genuine curves in the most dignified way. No other dress is as competent as the saree. A woman in India looks absolutely complete when draped in a saree, and equipped with beautiful ornaments and a shimmering bindi on the centre of her forehead. Goddesses in Indian religions have been adorned with sarees. Infact, sarees are even considered as a sacrificial offering to many goddesses. The real significance of the saree lies in the management of such a huge piece of cloth in an aristocrat way. Sarees are usually linked with the managing abilities of a woman, just like how she manages so many important or trivial chores in a perfect fashion while being at it. Women look most refined, polished, charming, and lovely while performing their chores while at the same time, creating a harmony wherever they are. Now days, the meaning of saree has been changed as it is more related with showing skin than concealing a woman’s body. Earlier it was worn to hide the waist but now screening the waist line has become important to look gorgeous. 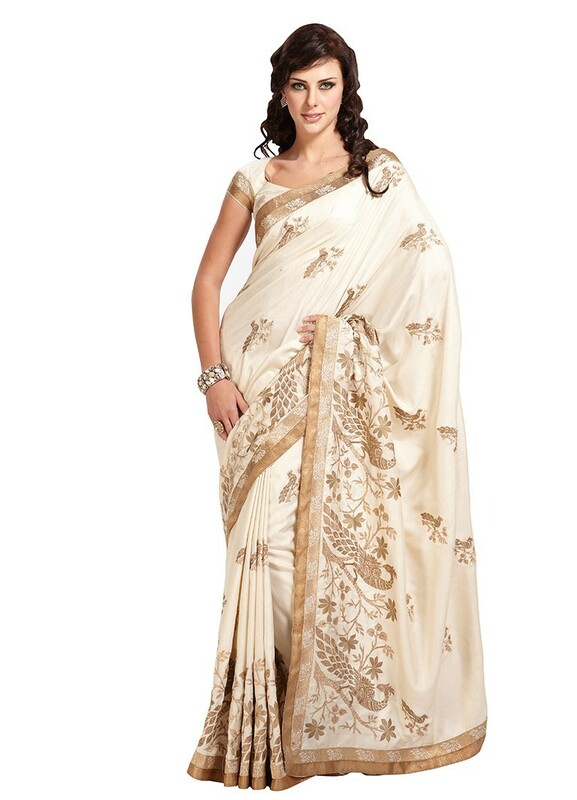 The lady is considered as more dazzling and striking when she wears the saree in such a fashion. In India, pallav (a part of the saree) is drawn on the head to pay due respect to the elders or while attending ceremonies. Even today, in the interior parts of India, it is mandatory for a lady to cover her face, so that no other person except her husband can have a glimpse of her beauty. India hasn’t been immune to the western influence & culture. It would not be wrong to state that western dresses have indeed penetrated into the Indian culture to a huge extent. However, the importance of the saree cannot be denied as it is matchless. With the transformation of time, many Indian women have followed western trends and they wear jeans, capri, and skirts on a regular basis. But when it comes to cultural festivals, sarees is the way to go. Cotton sarees are the most comfortable ones and are worn by ladies in summers. When it is worn by working ladies with crisp starch, they magnify its classiness to the zenith level. Silk sarees can be easily draped because of its soft fabric but Banarsi sarees are little difficult because of their massive stuff. While getting married in India, every lady is definitely blessed with at least one Banarsi Saree as it is considered as auspicious. Its beauty lies in the sparkling glitters equipped with silver or golden carving of borders. Remember, sarees have a beautiful history behind them. If you’re thinking of wearing one, the benefits are many — but it’s not easy. Sarees do take a little extra time to be draped but it has a matchless comparison when it comes to beauty, as they are the replica of the rich Indian heritage.